Again and again, I notice that marriages (and other long relationships) are very frequently the opposite of how they appear. The hapless, loopier-seeming one is usually the rock. The stoic, competent-seeming one is usually the anguished basket case. The quiet, gentler one is usually the dominator. These observations are most reliably true for longer-term relationships (where there's time for roles to settle in - and for outsiders to observe evidence of the true dynamics). But I don't think it's that long-term relationships become like this; it's that relationships like this are the ones which survive to the long term. These dynamics, in other words, appear to be the foundation of compatibility. An awesome craft beer bar recently opened near me. Their tap list is a treasure trove of esoteric kegs. The glasses are correct, the lines squeaky clean, bar stools comfortable, and prices fair - no pint costing over $8. Life is good! However, the affable bartender was quickly replaced by preening kids who are too cool to take your order, and they blast really stupid music so loud that you'd think you're at a rave. And the place takes a loss on some really fancy beers, out of reluctance to charge what they must. The managers are afraid to be deemed snobbish...so it's only a matter of time before they start serving cheaper products, i.e. the same swill everybody serves. They are, in other words, doing their level best on several fronts to degrade into the dumbest bar in town. Why? Terror. Terror of doing something no one else in this town has ever done. Terror of traveling an unproven path. Terror of following their convictions. So they're hedging their bets by making the area's best bar also the area's shittiest bar. Something for everybody! There's a certain moron logic to it: the more people you try to delight, the more people ought to come. Who can argue with that? We came to view our unwieldy interface as a boon. It took forever to do anything on Chowhound, which repelled a huge percentage of newbies, and also filtered out regulars who were less than fervid. We were satisfied, because the quality of our food tips was better than ever, with only the most devoted hounds sticking around through the adversity. The result was a fantastically distilled resource which, in turn, attracted a huge number of onlookers (to read if not to post). Is it really so hard to grasp? The more foliage you remove, the more beautiful the garden. Great, narrowly-focused operations can have surprisingly broad appeal. It’s an error to think you need to aim broad to get broad. You do, however, need some courage and some patience. And that, really, is the rub. Some business people have some willingness to sometimes consider somewhat fresh approaches, but vanishingly few can invest courage and patience into such experimentation for any length of time at all. It's the summer of 1979. I'm hitting the beach with my friend Steve, and we bring a boom box. I want to bring tapes of Frank Zappa and some of the other cultish bands Steve and I listened to. Steve wants to bring Aerosmith tapes. Incredulous, I ask why. He tells me "Chicks like Aerosmith". I pointed out that we could non-attract 95% of stupid girls on the beach with the same drek everyone else played, or we could be the only game in town with good music, drawing the admiration of every cool girl within earshot! It seemed the most logical thing in the world. But I could not make Steve see it. On the other hand, Steve is now a zillionaire banking executive with a sparkly family and an apparently perfect life. I wear drawstring sweatpants around the house, and my last pair was on its last legs for months while I desperately tried to find a quality replacement. There are lots of high-quality options for women, but the ones for men are all crap. These, however, kill. Much better-looking than in the photo (I recommend the darker color). And instead of being fuzzy/fleecy, they're sort of felty. Fit great. 22 bucks. I've never been an Old Navy shopper, figuring it was all cheaply-made Chinese stuff that would fit poorly and quickly fall apart. I can't say these are artisan-stitched, but as long as they last I'm pretty sure they'll make me happy (obviously, it doesn't take much). For those who missed the link in the previous entry, I've uploaded a golden oldie article: Really Expensive Drinks and a Bite Followed by Thai Food at Blimpies....the surreal tale of discovering a Thai restaurant stealthily lurking within a Blimpie's sandwich shop. Here's the full archive of old writings currently on display at my somewhat dormant web site. In every era, there's a realm where creative talent happens to cluster. In the 50's, it was jazz; in the early 70's, it was filmmaking; and in the 90's, it was restaurants... Truly great work is being done; hearts poured out and brilliance expressed while the creative bar raises higher and higher. And if you don't dive into a zeitgeist, you may has well be dead. I'd certainly have spent the 1950's in smokey nightclubs and the 70's in movie houses (if I were alive in the 10's, I'd have been sipping absinthe and arguing philosophy in European cafes). And lord knows I put in my restaurant time in the 90's. --from my posting "Idiot Box No More"
--from my posting "Billions, Millions, Thousands"
The food scene is downhill, and it has been for quite some time. I've been saying so for over a decade, but my point seldom lands. Soon after I sold Chowhound, my friends assumed I was projecting. Fed up and burnt out, I was projecting my feelings onto my victuals. And these days, people assume I'm being willfully eccentric, or else simply curmudgeonly. There is more excitement about the field than ever. More food blogs, more foodie pop-ups, more books and TV shows. People talk about food, care about food more passionately than ever, and there is way more action in the dining scene, with a profusion of new faces offering vibrant concepts and artisanal yadda yadda. When I first wrote about a Thai restaurant quietly lurking within a Blimpie Sandwich franchise store, the notion nearly tore people's heads off. Now that sort of thing is nearly a genre. With all this bustle and all this cool stuff, how can I possibly say it's gone downhill? The early 1970's were an astonishingly fertile time for film. When that tap dried up, and the creative zeitgeist migrated elsewhere (as it always inevitably does), people didn't stop going to movies. Quite the contrary; the quality of early 1970s films had pumped up the industry, and the economics and hoopla remained in place for years after quality had faded. When quality tilts the other way, it's not like flipping a light switch. It's not that God farted over Hollywood, turning everything unpalatable. There were good and great movies in the late 1970s and all through the 1980s. There are movies good and great even today. But as a whole the industry pales in comparison to what's currently going on in TV, which is the current center of creative zeitgeist. Nothing can remotely compare, quality-wise, to a zeitgeist. Similarly, I'm not saying your favorite tamale place from the 1990's instantly lost its quality when the golden age of restaurants faded. That's the essential word: faded. It's gradual, and human beings are ill-equipped to register fade-outs. Like lobsters, amenable to being cooked if their water is heated slowly enough, our remarkable adaptability makes it easy to pull rugs out from under us, just so long as they're pulled real gradually. Remember how great those large Pepperidge Farm cookies were when they first launched? They've been continuously degrading, but most of us haven't registered the fade, so they're still for sale everywhere, shadows of their former selves. Or consider an even steeper descent: slice pizza in New York City. If a time traveler from 1975 suddenly found himself in even one of our better slice joints (aside from Joe's and Sal & Carmines), he'd spit out his first bite in disgust and ask whether the pie had been shipped in from Nebraska. Yet these places make good money serving Nebraska pizza to gothamites, because the fade to awfulness was so slow (in fact, 1970's slice pizza may have been its own mini-zeitgeist!). So there are already two caveats confusing my point. Food's largely lost its luster, but 1. that doesn't mean it's all bad, and 2. it's been a gradual fade, so people mostly haven't noticed. To add to the confusion, as with film after the heyday of the early 1970's, there's still ample lingering passion for the product, which has been cannily manipulated by business interests flocking into a realm previously swelled via sincere grassroots creativity and talent. These second-wave guys are not in it for the creativity, talent, or sincerity. It's that they noticed the swelling (they don't want to sing; they just want to be singers). When films like Midnight Cowboy, The Graduate, MASH, Clockwork Orange, The Godfather, and Dog Day Afternoon gave way to films like Chariots of Fire, Raiders of the Lost Ark, ET, and The Right Stuff, did people consciously register the drop? Even now, it's hard to see it through the patina of reputation and conventional wisdom (both of which are salable commodities). Those latter four are considered classics, held in awe. Shoot, I like them, too. These are demonstrably masterful creations, with production values at a much more consistent level than the slightly shaggy craftsmanship in some of those earlier ones. But are they soulful, like the (slightly) earlier films? Through this lens, can you spot what I'm pointing out? When a creative zeitgeist - characterized by soulfulness, nuance, and fresh originality - fades, the vacuum is quickly filled by high competency and shallow cleverness. Iconoclastic creativity gets replaced by genre and formula. The resulting landscape isn't sullen devastation. It's a sparkly circus, where holdouts and misfits seldom tread (or at least not very enthusiastically). That's what's happened to the food scene. After serving as an illuminated high point of popular culture for a decade or two, it's been seamlessly commercialized. Even highly independent operators have fallen into a second-wave mindset less about cooking from heart and soul and more about competently vying to be a big light in a field originally swelled by sincere grassroots creativity and talent. They're mostly there because of the swelling. Singers, not singing. When a critical mass makes that flip, the human flocking effect begins to work against us. The same mechanism of contagion which can inspire people to such a high level can also distract attention and obscure vision. Especially when there's lots of money to be made. As with neighborhood gentrification, soulfulness and freshness inevitably drain from the equation, and the sort of slightly shaggy luminous visionaries - spawned anew in each generation, in spite of it all - who originally set the stage set their sights on farther-flung landscapes. The obituary column in The Economist continues to feature some of the best writing of our time (here are some previous Slog references, and here's an index of recent columns). Away from work, the world he was analysing weekly was kept at bay. He did not own a television set, and found the best use of computers was to listen to American civil-war songs. Some of his pieces were pounded out on an ancient Olivetti in a turret of Barbara’s family castle in the Alps, surrounded by peaks and clouds. If you've been sucked into the hoopla over Seymour Hersh's piece on the supposed vast conspiracy behind Bin Laden's assassination, you may want to read this, the most methodical debunking, from Vox. I couldn't make it further than a few hundred words into Hersh's article; too many micro-doubts kept pinging me, starting with the fact that the longtime New Yorker veteran had published the article in London Review of Books. It's painfully obvious that his magazine of residence for the past 22 years had rejected the blockbuster story. That, just in itself, is an extremely bad sign. It appears the 78 year old Hersh has fallen into conspiracy mongering, and gone (as Max Fisher puts it in that Vox piece) off the rails. Conspiracy mindedness, like collecting or offense-taking, appears to be a viral madness. Anyone can catch it. Hersh's 1997 book about John F. Kennedy, The Dark Side of Camelot, made a number of controversial assertions about the former president, including that he had had a "first marriage" to a woman named Durie Malcolm that was never terminated, that he had been a semi-regular narcotics user, that he had a close working relationship with mob boss Sam Giancana which supposedly included vote fraud in one or two crucial states in the 1960 presidential election. For many of these claims, Hersh relied only on hearsay collected decades after the event. In a Los Angeles Times review, Edward Jay Epstein cast doubt on these and other assertions, writing, "this book turns out to be, alas, more about the deficiencies of investigative journalism than about the deficiencies of John F. Kennedy." Responding to the book, historian and former Kennedy aide Arthur Schlesinger, Jr. called Hersh "the most gullible investigative reporter I've ever encountered." I wondered about this as a kid, and then again when the century changed: how long would it take before it really felt like a new century? How long, in other words, before it stopped sounding tongue-in-cheek to refer to "the previous century"? I think the answer is: right around now. Fifteen years. Perhaps it's because a critical mass (i.e. everyone under 18, if you add 3 years for the haze of early childhood) has little or no memory of the last century. Or perhaps it's because we've had time to recover from the weird "aughts" decade, when it was hard to speak the year without sounding awkward. Or perhaps it's that we've grown tired of making smirking reference to "the last century" - sort of like how new parents and new presidents find their new roles a bit ironic until they get into the thick of it, and the irony itself feels passé. In other words, it's not that we've become accustomed to being in a new century, it's that we've grown tired of acknowledging its novelty. Next question: when will it seem exotic to say you remember the twentieth century? If my first guess - that a critical mass has matured to a benchmark age - was correct, then I'd guess it'll be 2062, when all who remember the century are above retirement age (or the age where they start taking rejuvenation pills or whatever). Nothing ever actually happens to you. Stuff happens around you. The awareness at your core - which has blithely hummed as it has peered, ever since childhood, outward from your eyes - has never wavered amid the ever-changing plot points of your life. If you get so lost in a horror movie that you genuinely feel yourself suffering, the move isn't to yearn for a different outcome in the movie's plot; it's to realize you're the watcher, not the actor. Cooking is the least developed art. Composers moan that all the great themes have been used. Despairing painters concocted postmodernism in order to legitimize recycling. The forms of dance, fiction, and feature film have seen enough permutations that we've largely given up hoping to have our minds blown. They're all tired. But cuisine-as-artform, having explored only a few rococo avenues and a few streamlined ones, has barely hit adolescence. The obscure culinary sub-genre which most interests me (having spent much of my life coping with refrigerated chowhounding detritus in the form of takeout containers) is reheating. And that's in its infancy. It's wide open. 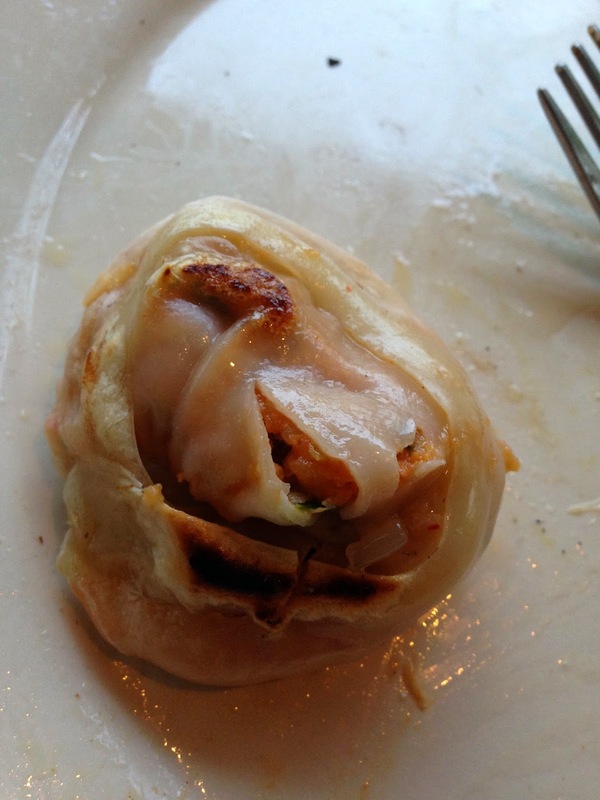 Consider dumplings. We steam them or we pan fry them. Period. 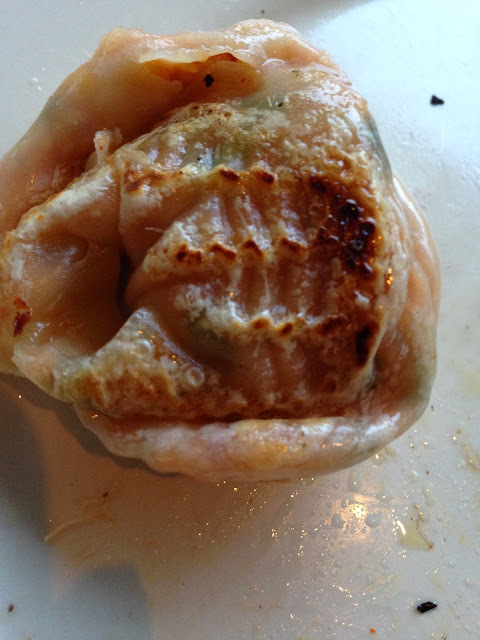 But what about heating frozen dumplings, greaselessly (which is to say: very carefully), on a cast iron griddle? Grease, I'm starting to understand, is nearly always a gratuitous shortcut. Lousy things taste better when they're cooked in grease. So don't cook lousy things! And things burn much more easily when griddled sans grease. So griddle more carefully! If you want to cook healthily, just swap in care and love for grease and salt. These frozen Korean spicy mandoo from H Mart were delicious, though I had to watch them like a hawk, flip them like spies, and ride the temperature settings like a metallurgist. My pan (I used this one, which is also great for tortillas) was well-seasoned, pre-heated, and mostly left at more or less medium-heat. And I hardly took my eyes off them.